See how we can customize a training program to meet your specific needs. "Change is the essence of life. Be willing to surrender what you are for what you could become." Whatever the circumstances, whenever people are asked to do things differently, they are faced with the challenge of disrupting their habitual ways of doing things in order to achieve a different outcome. It would be a simple matter if the desired change entailed only positive benefits to, but unfortunately, all change is encumbered by both desired positive outcomes as well as undesired negative consequences. This tends to make people feel awkward or uncomfortable as they struggle to eliminate current behaviors and learn new ones, and this challenge can frequently even undermine the change initiative. People almost alway do what is in their best interest. Any current behavior, therefore, exists because there is there is a desirable payoff or benefit to the behavior that is stronger than any payoff from not performing that behavior. Similarly, while one can envision benefits (payoffs) from changing a particular behavior, there will also likely be potential negative outcome from the change. The following Dynamics of Change Model can assist us in appreciating the inner struggles associated with most change initiatives. 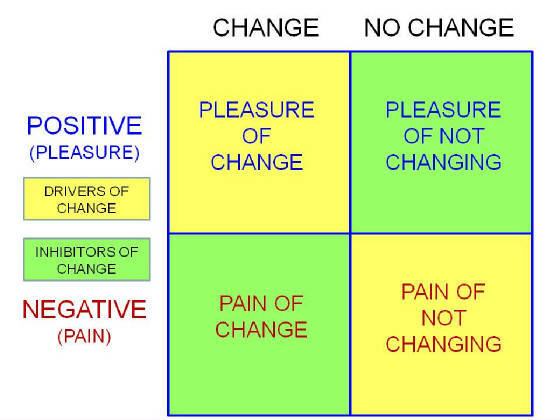 The model illustrates that for both change and no change conditions, there are both positive payoffs (pleasure) and negative payoffs (pain). The model applies to individual, groups and entire organizations. 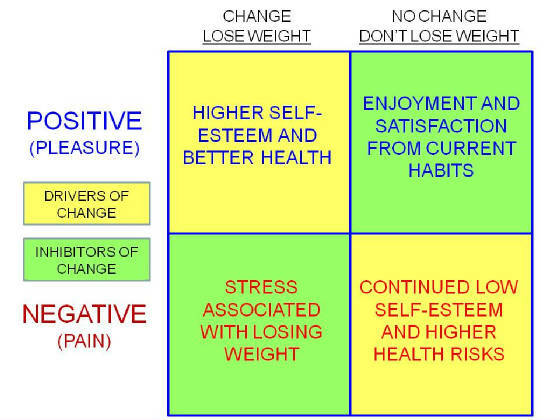 If we plug in a specific example of a change initiative such as losing weight, the grid would look as follows which includes the positives (pleasure) for both change (losing weight) and not changing (not losing weight) as well as the negatives (pain) associated with both conditions. The next grid depicts the the dynamics of the current situation of being overweight. 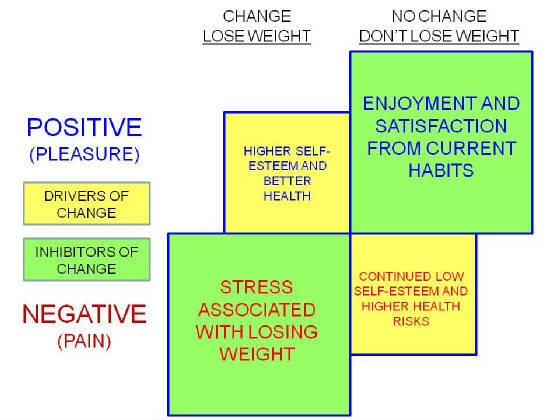 In the current situation, the PLEASURE of remaining overweight (no-change) is greater than the pleasure that is perceived for losing weight (change) and the pain associated with losing weight (change) is greater than the PAIN associated with remaining heavy (no change). 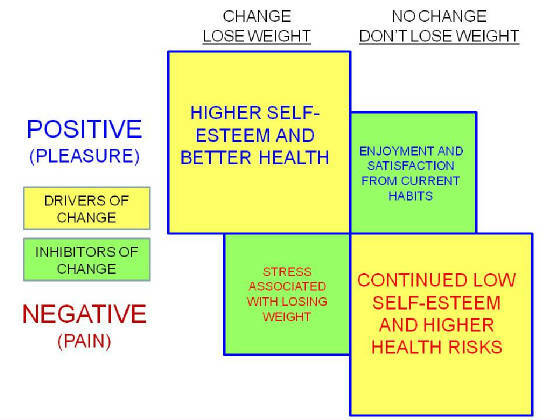 It is a simple matter of the inhibitors of change being greater than the drivers of change.This is the reason why the hypothetical person in this example remains overweight. Both condition must be met so that the pleasures associated with losing weight become greater than the current pleasures of remaining heavy and the pain associated with remaining heavy must become greater that that associated with losing weight. If onky one or the other condition exists, the change effort will be faced with continual attempts and setbacks, and will ultimately fail.